Having recently tried Small Town Brewery's Not Your Father's Root Beer, I understand the excitement. A delicious, nostalgic adult drink that tastes just like childhood. With the surging popularity and exponential growth in the hard soft drink segment, Anheuser-Busch even announced its own Best Damn Root Beer. 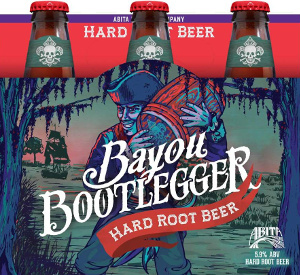 Now, Abita Brewery is getting in on the action with Bayou Bootlegger Hard Root Beer. The brilliance here is that Abita was already making non-alcoholic root beer in addition to their excellent beer. They're simply combining their expertise to put another adult root beer on the market. I'm very much looking forward to this one.